There is perhaps one question I get asked more than any other when it comes to, what I call, Tropi-scaping; "How on earth do you grow that in the ground here?" Well... I don't, at least not all of it. Today I'm blogging about all the things that we'd love to be able to grow but can't. Yes, I know this site is about Hardy Gardening, but let's all admit we like to buy plants that wouldn't survive one night outside in the winter where we live. I'm sure I'm not the only one with that guilty pleasure. So today I'm breaking the rules and talking about what we can't usually grow outdoors. 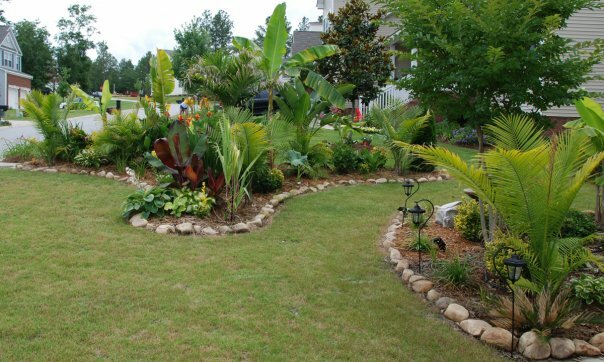 Over the years I've built up a pretty large collection of Palms, Elephant Ears, Bananas, Bird of Paradise, Traveler's Palms, Hibiscus, and other non-hardy plants that I love to make part of my landscape. So how do I do it? How do I turn the first photo seen below (winter 2009) into the second one (summer 2009)? On the next page, we'll go into the details of just how simple this is. The secrets is all in the shovel. It's as simple as digging a hole for the pot you have, and then "sinking" it into the ground. A good mulch layer over the top and no one would ever know the difference. 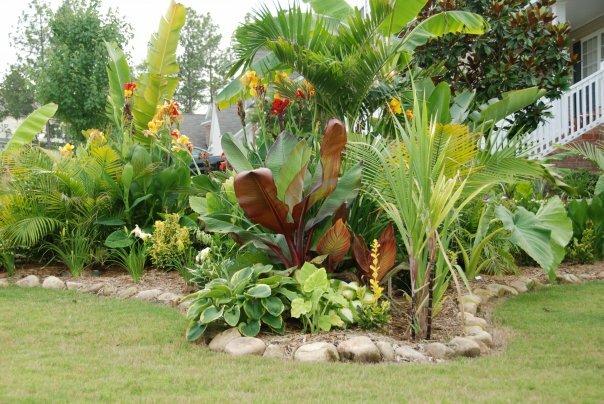 Suddenly you can grow Foxtail palms, Bird of Paradise, and other exotic tropicals in the ground all summer long. And no one's none the wiser to know what your secret is. It's so simple most people just don't think of it - or perhaps my neighbors don't spend enough time thinking about the logistics as they do gawking at the creation before them. But you can do this too. The trick is to dig a hole that fits your pot perfectly - not too deep or too wide. Once you sink the pot in, just fill back in the extra holes before mulching. As always, be sure to have your property surveyed for wires and/or pipes before digging. Some of the larger pots especially require large and deep holes. In the winter you can either fill the holes back in, which you're not likely going to want to do, or buy something to cover the holes up for the winter. We like to use plywood cut out to the custom shapes. It's rigid enough to hold weight over the hole, and small enough to easily move around in the spring. 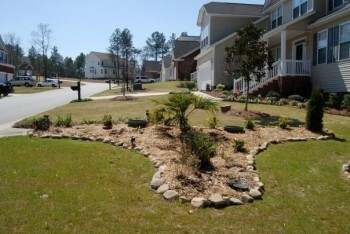 You can also easily mulch over the top of it to hide the wood (though the wood will typically match the mulch you use). We've tried a variety of other ways too, but that has proven to be the best method. For storage you can use a greenhouse or bring the plants indoors and use a Metal Halide system to keep them alive. See our blog about HID Lighting and Metal Halides for more information. Well, there you have it. The simple way to grow what you can't, outdoors, in the ground, all summer long. Prepare to make the neighbors jealous of your own unique creation. Just love this style of gardening, a lot of work but well worth all the effort. I have been bringing my garden in and out for over 25 years. My blog is actually all about "tropiscaping"! I'll be sure to share the before and after on my The Rainforest Garden Facebook page! In late winter, scrape off the top 2 inches of old potting soil and replace it with fresh soil. You do not have to be gentle; you will be scraping old roots, too. Go for it! Then add Osmocote slow release fertilizer "for indoor plants" per the label instructions. At this same time, prune as severely as you like, using sharp, clean pruners and just above a node. Occasional use of a 20-20-20 water soluble fertilizer is also appropriate. The plants will respond beautifully to this treatment.